Take Action by Sunday Nov. 18 – Oppose Dept of Energy Plan to Evade SSFL Cleanup! Had DOE complied with its obligations, the tragic Woolsey fire that appears to have begun at SSFL and spread far throughout the region would not have carried with it the risk of spreading contamination far beyond SSFL in the smoke from the burning polluted vegetation and soil. Ironically, during the same time as the SSFL fire, DOE has been soliciting public comment on its newest plan to break out of its cleanup obligations in the future. Rocketdyne should have been cleaned up long ago. Now, some of our worse fears have been realized – the Woolsey fire, which appears to have started at Rocketdyne (Santa Susana Field Laboratory or SSFL), has burned through a good portion of the site, risking more exposures to SSFL’s radiological and chemical contamination. On April 10, families impacted by childhood cancer and community members near the Santa Susana Field Laboratory (SSFL) protested the failure to meet cleanup deadlines for the site’s nuclear and chemical contamination. The demonstration took place prior to a meeting held by Department of Toxic Substances Control (DTSC). 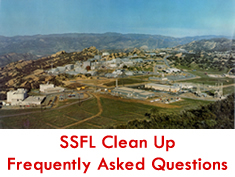 Thousands of comments submitted on DTSC’s draft Program Environmental Impact Report (PEIR) for the SSFL cleanup criticized the agency for violating cleanup agreements by proposing to leave potentially vast amounts of nuclear and chemical contamination on site. The Dept. of Toxic Substances Control (DTSC) has finally released its draft Environmental Impact Report (EIR) for the SSFL cleanup. The EIR violates the AOC cleanup agreements DTSC signed with the DOE and NASA for full cleanup of their SSFL areas. For Boeing’s part of SSFL, the EIR blocks from even being considered cleanup to the standards DTSC hand long promised. FOR RELEASE: Has Boeing Absolutely No Shame? “Protect Santa Susana from Boeing,” a new website launched today by cleanup advocates, reveals Boeing’s underhanded efforts to get out of cleaning up its SSFL contamination. The groups also decry the state toxic department’s newly released draft Environmental Impact Report (EIR) for breaking the agency’s previous commitments to a full cleanup.